Vacation rental lodge. Sleeps 16, 6 bedrooms, 6 bathrooms. No pets allowed. Gas Fireplace, full bath with separate tub and shower. Luxury and Location! 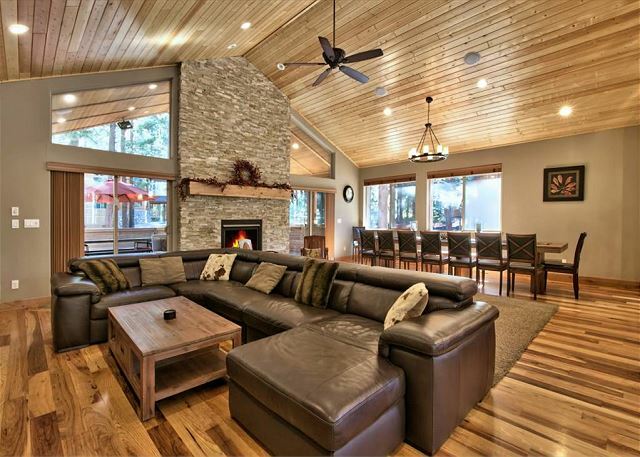 Here's your opportunity to rent a beautiful, newly-constructed 6 BR/ 6 BA luxury vacation home located just two blocks from Heavenly Valley Ski Resort's California Base Lodge. 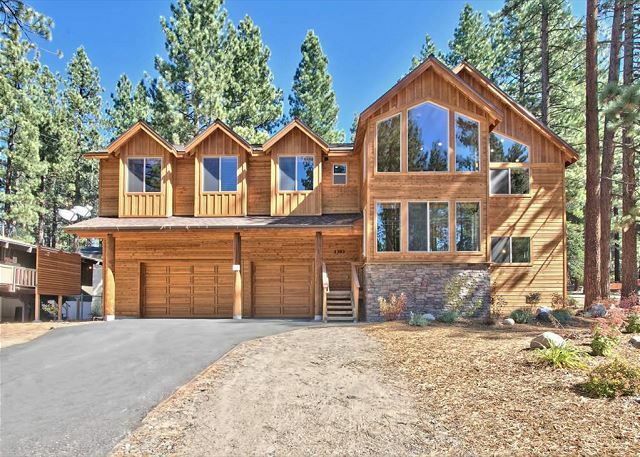 The home is situated on over a half-acre wooded lot with close proximity to Ski Run Boulevard and all the recreational amenities of South Lake Tahoe. 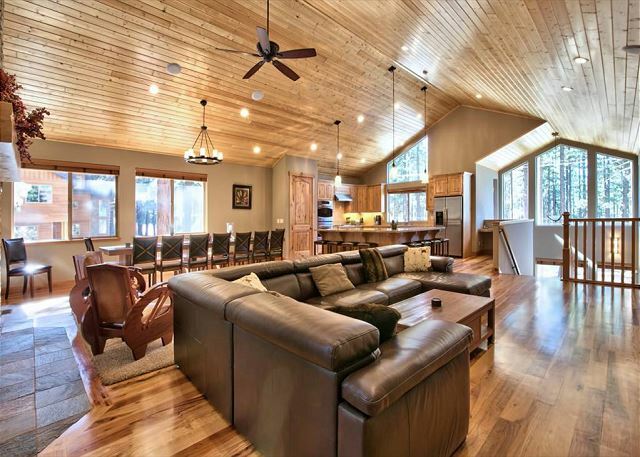 This home has an ideal layout, which allows for large, yet intimate, family vacations or group gatherings. * Custom Heavenly area home with 6 bedrooms and 6 en suite bathrooms and air conditioning! * Bathrooms are luxuriously furnished with granite/quartz countertops, glass shower doors and decorator stone and tile throughout. * Gourmet Kitchen is stocked with gadgets and kitchenware. All top-of-the line stainless steel appliances. Over-sized granite island has prep sink and additional seating for 8. 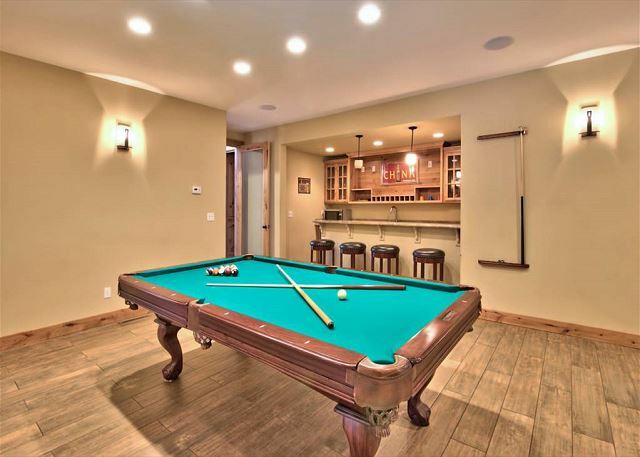 * Pool/ Game Room/ Bar includes a connoisseur's pool table, sectional sofa (with pull-out queen bed), 50? flat panel TV with internet access, gas fireplace and wet bar equipped with granite counters, sink, dishwasher, microwave and refrigerator. * Enclosed Spa Room includes a hot tub with intimate sectional seating and gas fireplace - a perfect place to unwind apres ski or after a day of summer activities. High-end hot tub has capacity for 7 with customized spa settings and center foot massage jets. Bedroom 6U King bed, Flat screen TV, Gas fireplace, master bath with separate tub and shower. Maximum Number of Vehicles: 5 vehicles must be parked in garage or driveway, no street parking allowed. We loved this house. Loved the location to Heavenly Lodge (walking distance really). Saw a family of bears (glad the hot tub is enclosed)!! Great floor plan. Kitchen really is fully stocked. Loved that each bedroom had an ensuite bathroom. Very clean. Management easy to work with. We'll book again for sure. Only complaint was the master bedroom blinds were missing which isn't ideal for privacy (told management company as soon as we got there so I'm sure it will be fixed for next guests). 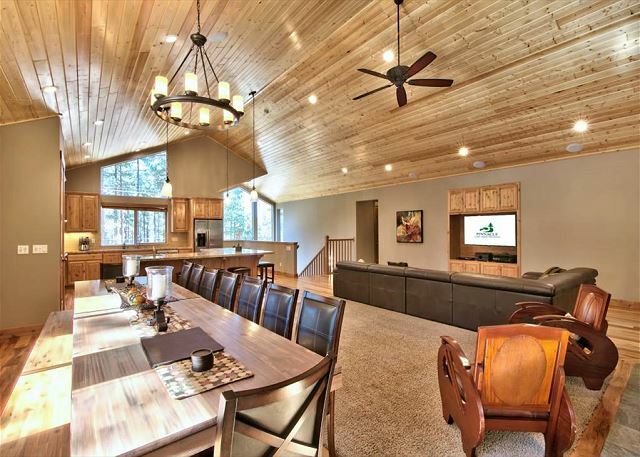 What an amazing house and location if you plan to ski. During our week long visit the mountain had 9 ft of snow. The road and our driveway were cleared daily so never a problem. Several days we walked to the California lodge to ski and walked home in the afternoon. Right around the corner from the house was an amazing German pub with great food and drinks. The layout of the house is perfect and provided plenty of space for everyone to relax and hang out. We rent large homes each year in different ski locations and this house was the best one we have rented so far at any price point. We stayed at the 1393W Wildwood Lodge for our annual family snow trip. We enjoyed our time at the lodge and all that it had to offer. We had a party of 14, including an 18-month old, and everyone had more than enough room to do whatever they wanted to do without disturbing other activities. My niece recently had knee surgery (week before trip) and was able to move around without any issues (including going up/down the stairs) and recline on the sofas chaise. We spent most of the time in the great room - which had a 50-inch TV with surround sound system to keep the kids entertained - and the kitchen, which has an enormous island. 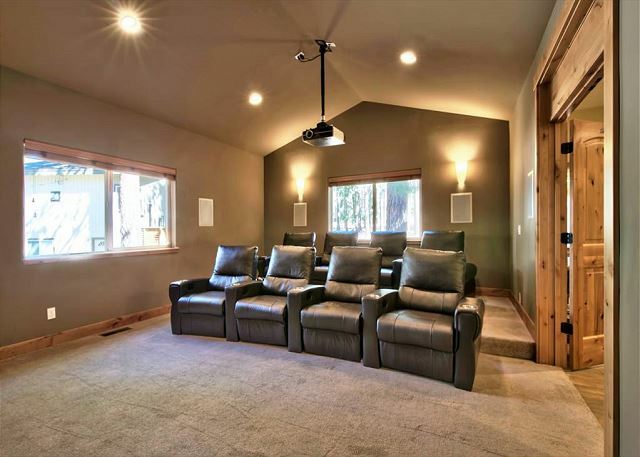 We watched movies in the home theater room, which was an awesome treat. We cooked for most of the meals and the kitchen was fully stocked with the supplies needed, e.g. pots/pans, small appliances, ovens, etc. Location was also a positive. The lodge is just down the hill from Heavenly. Also, Pioneer Trail and the main strip is not too far off. We have stayed at multiple locations for our snow trips and the 1393W lodge is by far the best one we have stayed at. Thank you so much for the great comments and we hope you stay with us again! Overall our stay was fabulous! The location was perfect for our nieces’ heavenly lake view lodge wedding! The home was very clean and all the furniture, beds were in very good condition. We had some problems initially but the property managers were very responsive and fixed our issues right away. Unfortunately by the time we were able to try out the hot tub there was no time for us to have the issue resolved. The spa was extremely hot and temperatures did not adjust! The water was smelling “funky” and my brother in law, also a former owner of a pool maintenance business, felt that the water was way overdue for a change out. So unfortunately we were not able to take advantage of the spa. Thus the reason for our 4 star reviews in those areas. Thank you for the feedback, we had changed the water previously to your arrival and we have called out the Spa and pool company to make sure everything is working properly with that hot tub for all future guests. We took our family to Tahoe to celebrate our 50th anniversary and the Heavenly Wildwood Lodge was perfect! We had 13 people ranging in age from 8 yrs to 74 yrs. The lodge was beautiful, spacious, clean, fully equipped and centrally located. We hiked, played pool, had time in the large spa, watched movies in the theater, enjoyed the wonderful deck for morning coffee and were entertained each day by a mamma bear and her three naughty cubs! One evening we took a sunset cruise with the Tahoe Boat Ride company. The captain and crew were the best. We could not have asked for any thing better! On our arrival we even received a welcome basket with a bottle of wine and some munchies! We made beautiful and lasting memories on this trip. Check in and out went smoothly. I would definitely recommend this home to anyone!!!!! We had a fabulous time hosting our family from the US and Spain for a few days. The perfect combination of public and private spaces for all. Really fabulous interior. No privacy from the deck, exterior or hot tub room. A few light bulbs were out. Couch back was so low it is not functional. Internet was not working but I followed instructions and got it going. Very tight parking for getting into the either left or right side of garage because driveway is narrower than the garage and there are large logs so that took some getting used to and assistance by all. Thank you-we hope you stay with Pinnacle Lake Tahoe Getaways again. The house was perfect for our small group of 8 adults. You can technically walk to the base of the mountain, it might take 10 minutes in ski boots. It is also about a 10 minute walk into town. Perfect location, right in the middle of things. The home had everything we needed to cook anything you could imagine. The theatre room came in handy when we wanted a quiet night at the house. My husband and I agreed that we would stay here again when we are in town. The only downside I can recall was that the family room rug smelled like beer. My husband and I noticed when we did yoga each morning and it was kinda gross. I am so sorry we had the carpets cleaned not long ago but not all tenants are as respectful as you were, we will clean them again. The house is perfect for a large group (we had 11) but it can accommodate more. 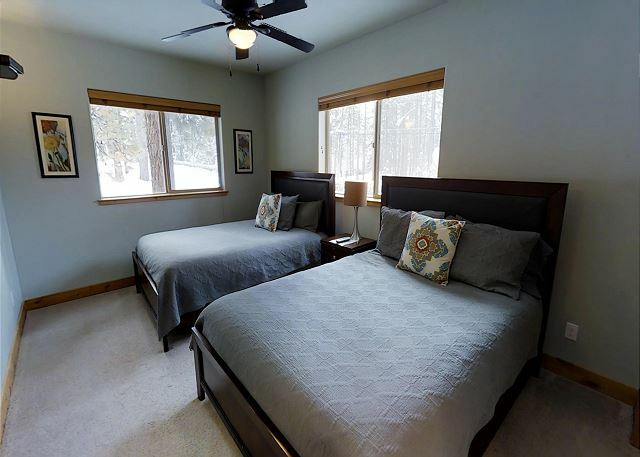 The house is large, and is beautiful... clean, equipped (kitchen), comfortable, and great location (close to resort/skiing, and casinos but feels private). We asked the management company for service on the Jacuzzi which was quickly responded to, and resolved. We all wished we'd scheduled for longer (3 nights) because we weren't ready to leave.... We'll be back... ! We welcome you back! Thank you so much for the nice feedback. This property was perfect for the 6 couples that stayed. There was enough room for anyone to have their own space when needed. The management team made the entire process so easy and were readily available for any questions/concerns I may have had. Thank you, we are glad you had a good visit and hope you stay with us again. I can't say enough about our recent stay! My best friends and I celebrated our 11th Annual Bro's 'N Brews trip and this house was the star of the show! 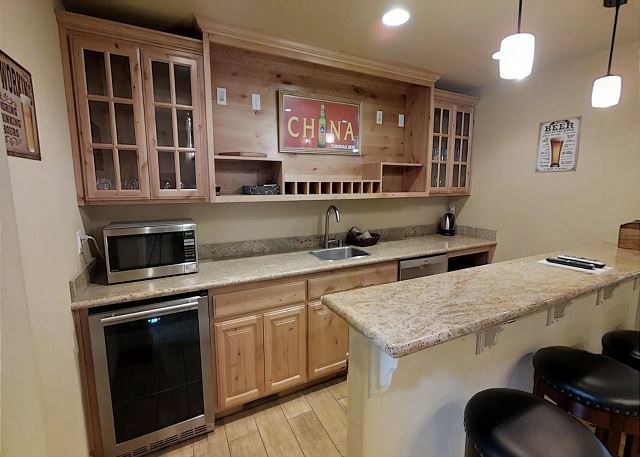 Best vacation rental we have ever had so far in 5 years coming to Tahoe! We are looking forward to coming back again next year! The Chang family was very generous in that they had a very nice gift basket delivered to us upon check-in! A very nice surprise and classy! Best location, luxury, amenities, and size ever! I'd recommend this house to anyone! Thank you so much! We appreciate the positive feedback. Jacque Y from Kew, VIC does not recommend this vacation rental. The house was very large and looked better in the pics online than in real life it just didn't really have a heart sadly. The kitchen was well equiped which we loved but the beds were all so very soft that I ended up with an bad aching back and so did a couple of my kids. There were a number of things broken eg theatre seats but it was clean. Sofa upstairs very uncomfortable and far too low not to mention close to the tv. It would have been helpful to have a remote for the garage. Given what we paid which was a lot and included a lot of extras (eg hot tub which we didn't use) to stay here I would have liked a bit more bang for my buck. Thank you so much for the feedback, we will share this with the homeowners. We will definitely work on the theatre chairs. We had a great weekend here. The house was just as advertised. Thank you! Hope you come visit Tahoe again soon-we may even have snow! What a dream come true! The house was everything I expected and MORE. It was an ideal location, very spacious (no one felt like they were on top of one another) and had everything you could want/need. We even received a welcome basket which felt like such a wonderful gesture! Highly reccomend! We are so good you had a good stay and we hope you visit Tahoe again soon. This location is everything the photos show and so much more. The home owners, property management and locals were amazing. 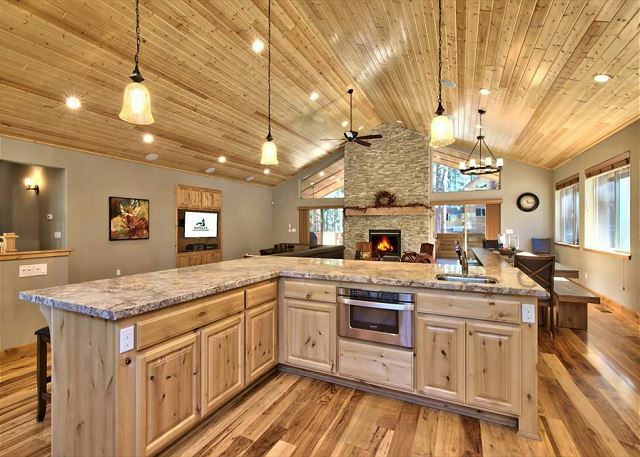 This home is equipped with everything you could ever imagine. We had 13 ladies for a weekend of fun for my 35th birthday and it was the best decision I could have made. The only delimma was the projector, but the 24 hour customer service sent someone out immediately. We received a welcome basket from the owners and felt at home. I would advise anyone that would like to go to Tahoe with less than 16 people to stay here! Thank you so much-we had glad you had a good visit. Yes technology can get tricky some times. The house was perfect to fit all my friends so we could go to the casinos and around lake Tahoe to celebrate my birthday. We even got to Tahoe a little early and they let us check in before the time and a little gift basket was waiting for us which was an awesome little touch. I highly recommend this place! everything about the property was amazing. great floor plan, we had 11 people and there was more than enough space for everyone. lots of fire places and nice 48" gas grille outside. be careful with the spa temperature, it definitely runs hotter than the reading, i would say 95-98 is similar to other tubs 104F. also, the owners need to check out the projector because its a little blurry / needs some love. other than those two minor things, no complaints ! also, property is walking to Himmelhaus, a great german restaurant with amazing food and beer selection, don't miss it! I got married in Lake Tahoe and this place was a great place to stay at with my bridal party, husband and I. There was plenty of room for everyone. They had all the supplies to make it cozy. We enjoyed the theater, hot tub, and definitely the theater room. Not far from heavenly village, which is great! I definitely recommended and would love to stay here again. Amazing stay at an amazing house! This is our go-to house for our annual trip to Lake Tahoe. In fact, it has become our favorite part of our visit. 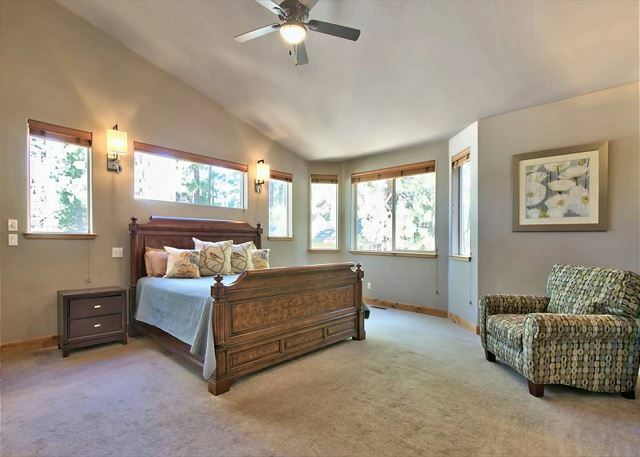 The property is beautiful, quiet, spacious, and luxurious. There were no absolutely no issues accommodating 13 of us. The location is great - a short drive to the casinos, or a quick walk to Heavenly Resort and the always awesome Himmel Haus. Thank you to Pinnacle and the owners for another amazing stay!! It's clear they care about their renters, as well as the property,and it is very much appreciated. Looking forward to our next trip in Tahoe! My family and extended family stayed at 1393 Wildwood over President Day week for 4 nights. This place is absolutely amazing. The two levels offer something for everyone. The pool table and theater downstairs kept us occupied for the entire stay. The only downside was the hot tub. It was not ready for us upon arrival as it had not been properly treated. The other downside was the fact that the hot tub water quality quickly turned poor only after 2 days of use (I'm talking smelled like a fishbowl poor). Other than that, the place was awesome highly recommend for large groups. Also a 5 minute walk to the Heavenly California lodge! I am so sorry the hot tub turned after two days of use, it was checked prior to arrival. We have added additional hot tub technicians to our staff to maintain our tubs. This house is located very close to Heavenly and very convenient to the casinos as well. We have stayed there a couple years and hope to again next year! It's clean, well-stocked, well-maintained, laid out nicely, and spacious. I wish I owned it! House was clean. Great for entertaining. Great for cooking at home. Walking distance to California Lodge at Heavenly but need cab to get to Casinos/restaurant/night life. Sleeps 7 couples/families easily with privacy. Definitely recommend this place, We will be back! Our kids and their families joined my wife & I between Christmas & New Year. Enjoyed the kitchen, game room, movie theater & hot tub. Separate bathrooms for each bedroom is a huge plus. Met our expectations and more. Hope to stay there again. This cabin is by far my favorite of my 10+ visits to Tahoe. This property offers great value for the cost. The rooms, living space, kitchen, theatre, and deck were all very spacious. My guests were thrilled with how beautiful and well taken care of this property is. The cabin is fully stocked with the essentials. We had everything we needed during our stay. 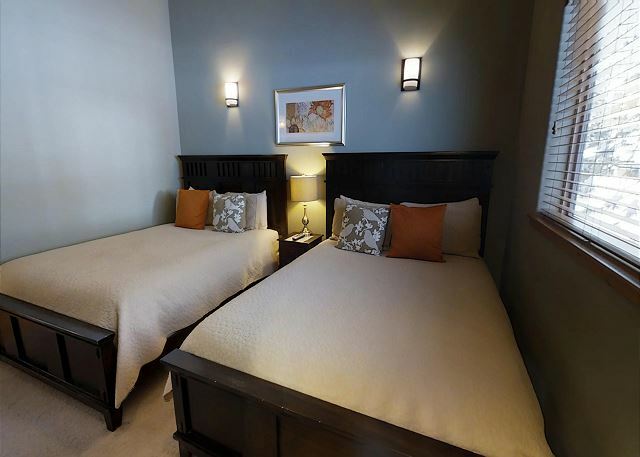 The cabin is conveniently located minutes away from heavenly and downtown. It made quick visits to the store a breeze. Can't wait to book this property on our next visit. Thank you for a wonderful stay! I had such a wonderful time with family and friends! I rented this cabin for my wedding party to have a place to stay with us! We had such a blast and made so many memories! All of the amenities were well used and appreciated! Will def stay here again! !